Discussion in 'Houston Rockets: Game Action & Roster Moves' started by jayhow92, Jan 4, 2019.
adw, c1utchfan925, KingCheetah and 46 others like this. Lawlruschang, Tfor3 and LUK3 like this. Remlap, c1utchfan925, napalm06 and 24 others like this. c1utchfan925, BaselineFade, napalm06 and 25 others like this. There's simply no explanation for it... and it's completely and totally unmissable. I really hate complaining about the refs (though I know it is justified occasionally), but I'm at a loss on this one. Deuce, Remlap, c1utchfan925 and 114 others like this. c1utchfan925, DooghMaster9, BigMaloe and 5 others like this. s3ts, Tfor3, Zergling and 1 other person like this. bmelo and Game7 like this. Brought back shades of Finley in the playoffs. But this took it to another level. NotInMyHouse, c1utchfan925, today and 35 others like this. Don't forget Michael Finely's missed out of bounds. That was in the playoff and we almost had them. I am not forgetting that like forever. Fxxk the Mavs and that Donkey Lucky kid. c1utchfan925, ilovehtownbb, DaDakota and 12 others like this. c1utchfan925, napalm06, Tankeio and 19 others like this. I know when stuff like this happens it’s fun to say, so and so is/was best/worst ever because it’s recent and fresh in everyone’s minds. But this actually is the WORST missed call I’ve ever seen. Unreal how it was ‘missed’. MadMax, Blurr#7, Jayzers_100 and 11 others like this. The only way the Rockets could've won after this missed call was if Harden put on his Superman cape. And then refs missed another call on the next shot. And so he scored the three. NotInMyHouse, c1utchfan925, DaDakota and 14 others like this. NotInMyHouse, c1utchfan925, darksoul35 and 47 others like this. 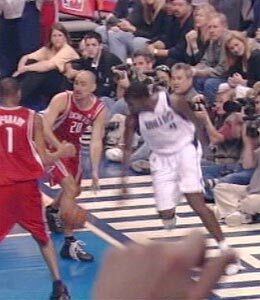 I had Michael Finley flashbacks. Thanks to James there will be no ptsd. c1utchfan925, Raider17, topfive and 9 others like this. Remlap, c1utchfan925, Raider17 and 14 others like this. hakeem94, theimpossibles1, PhilCollins and 1 other person like this. The ref was 15 feet away with an unobstructed view of Durant and he just swallows his whistle. Unbelievable. And then Kerr has the gall to complain about a call in the final minutes. The Finley play was a bit less egregious but was so much bigger in the grand scheme of things. c1utchfan925, FranchiseBlade, adw and 18 others like this. Even better: Steve Kerr, in his postgame interview, complained about the call on Draymond for fouling Harden's last drive. Dude, after 3 blind men eat their whistles on this howler, the least you can do is say nothing about the officiating. Deuce, Remlap, c1utchfan925 and 61 others like this. It's just such an unbelievable miss. I mean, it they were on the take they still would have to call that one. There is no explanation for that one. Just inexplicable. Y2JT, RocketWalta, Eric Riley and 5 others like this. NBA GameTime: James Harden & Gainnis can single handedly defeat Warriors? Who is the best left handed player of all time in the NBA? rod thorn re:1984 draft: would have picked 1st "hakeem olajuwon, hands down"